Alex Iwobi (Nigeria) has been named the African Youth Player of the Year at the 2016 Glo CAF Awards which was held in Abuja on Thursday night. 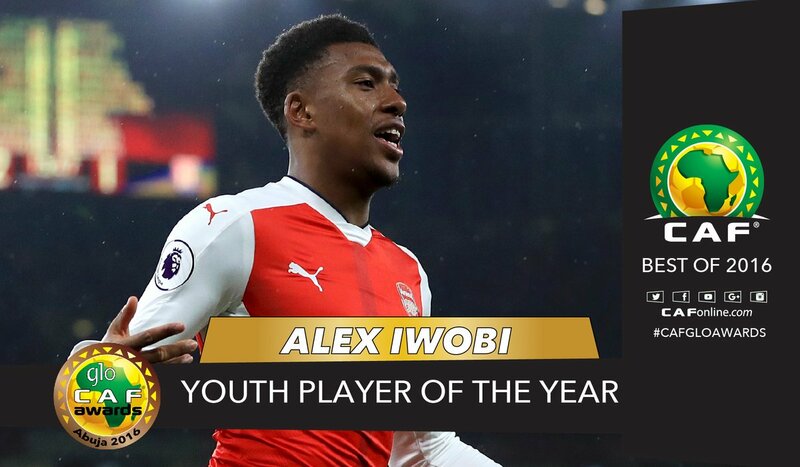 The Arsenal man bagged the laurel ahead of Eric Ayiah (Ghana) and Franck Kessie (Cote d’Ivoire) who were also nominees in that category. Arsenal made it known earlier that he will not be allowed to travel down for the event due to club commitment. Also on the award list was Manchester City's Kelechi Iheanacho (Nigeria) who bagged the Promising Player of the Year Award. I still wonder what the difference between the two awards won by the duo is. Anyway, congratulations to them, especially our own Iwobi. More to come!